PaleyFest is in full swing and this week’s “Out of the Box” is dedicated to the style highs from the Scandal, The Good Wife, Broad City, Outlander, Homeland and Girls panels. The line between casual/fancy is blurred at these types of events and on the whole it is probably best to remember there will be a lot of sitting down photos after the obligatory red carpet posing. Red carpet is where our focus lies, but first a moment of panel facial expression joy. This shot of Julianna Margulies and Christine Baranski is everything and I’m pretty sure their laughter could power buildings. A very fun look from Kerry Washington in Mary Katrantzou, which is all textured goodness including a sequined bodice and delightful collar. The pop of yellow and a darker lip color really makes this outfit sing. Another Scandal style high with Darby Stanchfield wearing a whole lot red in a 2nd Skin Co. super sparkly frock. This is an occasion where bold lip color is not needed as that would be a shade red too far. Patterns ahoy from Lena Dunham in Tanya Taylor and Jenni Konner working metallic color explosion with a black sweater and looking fantastic in the process. 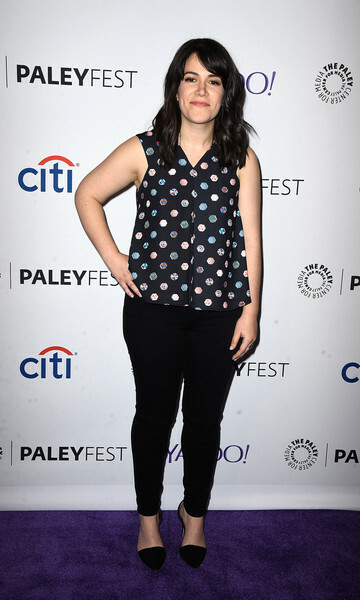 Relaxed cool from Abbi Jacobson at the Comedy Central panel in this not quite polka dot sleeveless shirt. Looking a whole lot like the tuxedo inspired jumpsuit Maya Rudolph wore at the SNL 40th anniversary is Outlander’s Caitriona Balfe. A reminder to catch up with Outlander before it returns coupled with the desire to finally try a jumpsuit on at some point in the near future. Leaving Claire Danes in Proenza Schouler until last because I’m pretty sure this can be filed under “Danes Style Blindness” as the snakeskin strip of random is a whole lot of what? and yet I also think she has pulled it off. Like I said this is a case of “Danes Style Blindness” – the phenomenon to describe someone who you think looks amazing no matter what they are wearing. Bonus “Out of the Box” this week with this magazine cover special.